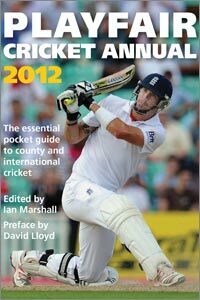 The 65th edition of Playfair and third under current editor, Ian Marshall, is again a must for all cricket supporters for the 2012 season. As usual, the pocket-sized annual contains all the relevant information which any fan can want and all for a very reasonable price. Ian Marshall has again written a very interesting foreword and is very happy that the county of his birth, Lancashire, won the Championship outright for the first time since 1934 and has asked a well-known Lancastrian, David Lloyd, for this year's Preface. The cover curse which appeared to blight the chosen person who appeared on the front of the annual for the following season showed early signs of returning as Kevin Pietersen struggled for form in the Tests in the U.A.E and Sri Lanka before returning imperiously to form in the subsequent ODIs. It may be the switch hit which he is seen playing which may be in more danger after recent debate about its use. The one change to this year's format is the omission of Women's Tests. This is simply because there have been none and their exploits in ODIs and Twenty20s are well covered. Every bit of information which any reader could expect is listed within the annual's 335 pages: Test and First Class career figures, 2011 statistical highlights and First Class figures, touring teams registers for this summer's West Indian and South African squads, List A limited-overs career figures, a resume of the 2011 World Cup, this year's fixtures and much, much more. The IPL is also given decent coverage. Again, Ian Marshall is to be congratulated on producing another invaluable and indispensable Playfair annual for the many fans who follow English cricket.